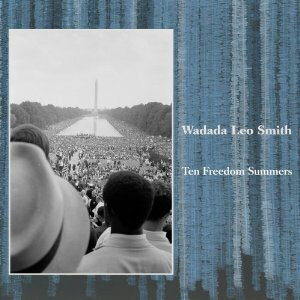 Wadada Leo Smith’s Ten Freedom Summers continues the lineage of seminal compositions inspired by the Civil Rights Movement, like Max Roach’s We Insist: Freedom Now! suite, that memorialize experiences of a tumultuous time without saccharine political proselytizing or falling into traps of nostalgia and longing. Ten Freedom Summers is a collection of 21 pieces over 4 CDs. The compositions don’t take the form of an orderly chronological narrative, but rather highlight the emotional and psychological experiences of individual events on both Smith and the more widely imagined African American psyche. Inspired by August Wilson’s “Pittsburgh Cycle” tracing a century of African American life in a series of ten decade spanning plays, Ten Freedom Summers focuses on the decade of 1945-1955, ten momentous years in the Civil Rights Movement, which include the ruling on Brown vs. Board of Education and the passing of the Civil Rights Act. Smith’s expansive interior journal, however, travels over 100 years of the Black experience in America, from “Dred Scott: 1857,” to “Medgar Evers: A Love-Voice of a Thousand Year’s Journey for Liberty and Justice” to “September 11th, 2001: A Memorial.” The years spanning 1945-1955 are explored not just as they were in lived experience, but as they are currently remembered by the 70-year-old Wadada Leo Smith. Smith, who is currently the Director of the African-American Improvisational Music Program at the Herb Alpert School of Music at the California Institute of the Arts, is an established member of the old guard of creative and new music, working with luminaries like Muhal Richard Abrams, Anthony Braxton and Roscoe Mitchell. Ten Freedom Summers bucks the tradition of overt political discourse associated (justly or not) with free jazz giants, with the impressionistic and experiential nature of these compositions. Smith’s expressive experimentation has, once again, produced an engaging and amazing project that honors his work as a composer and as a historian of the Black experience.